Stormwater occurs when it rains or snow melts. Stormwater runoff is a term used to describe rain and snow melt that does not percolate into the ground. Impervious surfaces, such as roads, parking lots, roof tops, and compacted land do prevent stormwater runoff from seeping into the ground. The presence of impervious surfaces results in an increase in the amount of stormwater runoff. Non-point source pollution is pollution that comes from many sources. As stormwater makes its way across the landscape and into the waterways, it brings with it non-point source pollution. Some types of non-point source pollution include oils, fertilizers, pesticides, animal waste, debris and sediment. 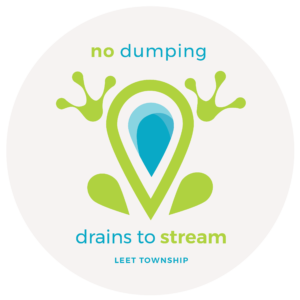 If you notice any illicit discharge such as oils, trash, pesticides, grass clippings, etc being put down a storm drain or in a waterway please call Leet Township Public Works at 724-266-8072 to report it. We appreciate your help to keep our waterways clean! To learn more about Stormwater Management and the ways you can help, please visit the EPA website.